This is part 1 of 2 this week on housing. Given that housing and affordability are at the forefront of many people’s minds these days, I have been doing quite a bit of data work to help myself understand what exactly is going on. 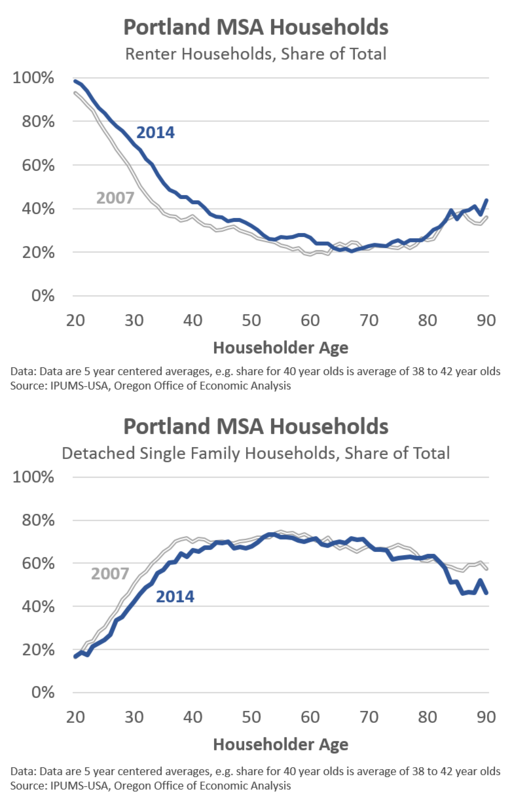 Affordability is a statewide issue, but our best and most timely data generally comes from the Portland MSA. While the data and focus here is on Portland, the results are generally transferable to other parts of the state, particularly other metropolitan areas. First, what type of housing do people actually live in? Previously we took a quick look at the housing stock itself, broken down into more categories. However, here I wanted to know how housing changes by age. It’s probably what you expected with younger households renting apartments, with a slow build of single family ownership through one’s peak working and earning years. 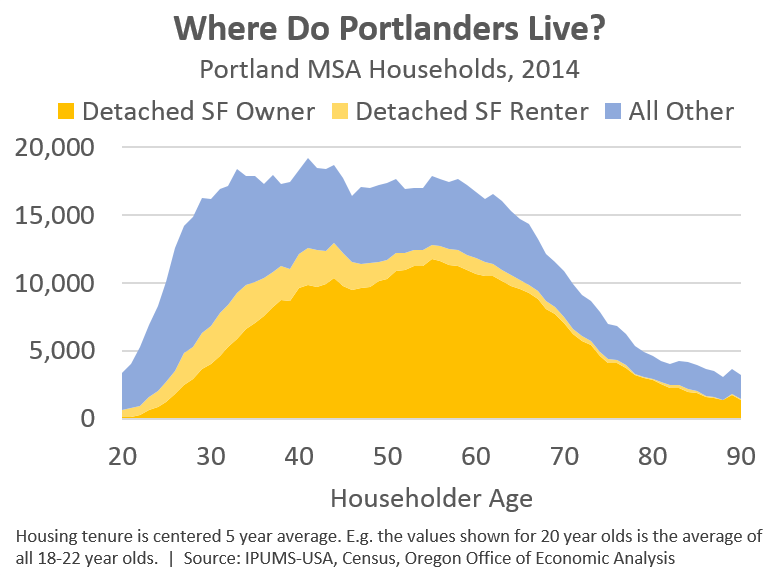 Overall 61% of Portland housing stock is detached single family homes (51% are owner occupied, 10% are renter occupied). What’s really important to understand in the market today and trying to make reasonable forecasts is how these trends have changed over time and where they’re going in the future. The graphs below compare 2007 to 2014 along the owner-renter and detached single family-multifamily spectrum. Overall there have clearly been massive shifts in the housing market in the past 15 years. First into ownership during the bubble and now back toward renting and multifamily. It is likely that much of these changes have already occurred today, as shown above. Of course they can continue a bit further in the near term. However over a medium or longer look, given demographics and finances, it is likely that both ownership and detached single family will make a comeback from where they are today. See our previous work on the impact of demographics for more. Our office does not expect the pendulum to swing all the way back to where it was during the housing bubble, but certainly for it to swing back part of the way. One big reason are those demographics. 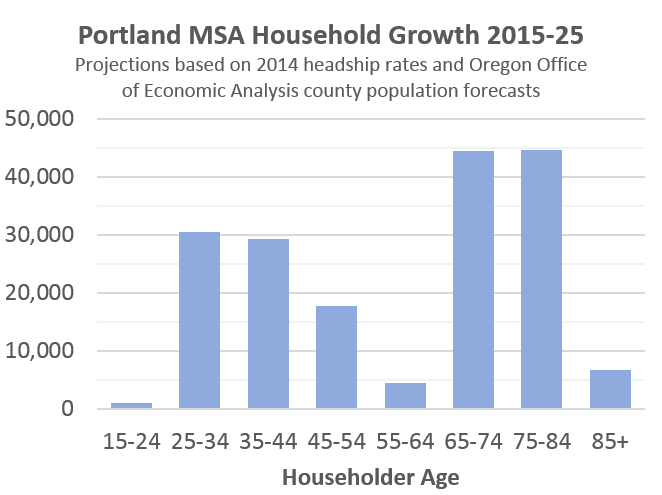 Even if national projections show that all new households will be among the oldest Americans, that’s not true in a popular metropolitan area like Portland. If you simply take household formation rates by age from 2014 ACS data and apply those to our office’s county population forecast, you get this outlook. Yes, the older ages will see the most growth as the Boomers age, but there are sizable gains among the younger ages as well due to migration and the Millennials. This is also likely more of a lower bound as it takes 2014’s household formation rates and applies those moving forward. Expectations are formation rates will improve along with the economy. You can roll your own depending upon these assumptions and while the specifics will differ, the general pattern will remain the same.